The trip will take place on September 16-18. The cost is 16,000 yen to be paid to MAJET when you arrive. Cash please! This includes all the campsite equipment, two nights' accommodation (bedding provided), breakfast, and nicely sized dinners. Lunch is not included. All drivers will be compensated ¥1000 per a passenger (passengers will be allocated to you should you choose to assist with transportation). THE FACEBOOK EVENT IS NOT AN RSVP. There is more information in the "Bandai and You" document. Please download it below and bring it with you! 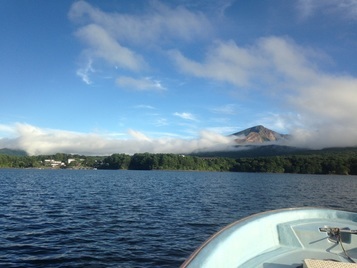 Lake Hibara is a beautiful spot under the shadow of Mt. Bandai, a dormant volcano. We will be staying in wooden cabins down by the lake and have full access to the site's bikes, kayaks, ping pong table, barbeques, and sento. 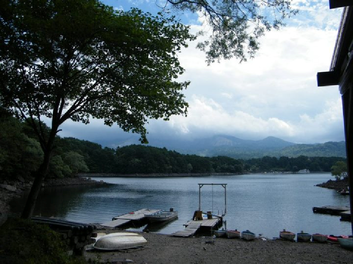 For the brave and beautiful souls amongst you, if the weather is favorable, Mt Bandai offers a challenging hike, the lake has a great cycling route around it, and there are small islands that can be swum/kayaked to. 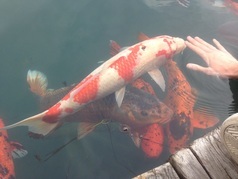 Those of you fancying a slightly gentler experience can visit the Five Colored Lakes or view one of the world's largest collections of Dali sculptures and paintings in a custom built gallery nearby. And those of you wanting a totally sedentary experience can just relax by the lake admiring the view! Text doesn't totally do the Bandai trip justice, so if you really want to know what Bandai is like, try asking someone that has been! BANDAI IS AWESOME! 16,000 yen in cash for MAJET. There is a conbini nearby, but don't count on an ATM. This is a BYOB event. So please bring your own alcohol - be it gin, cooking sherry, or Sapporo's finest, it is yours to bring. Some snack foods/lunches. Breakfast and dinner are provided, but should you want more food, bring some. There is a nearby conbini, but the quickest way there is by kayak. Rain clothes, just in case. Sunhats and sun lotion, also just in case. Mosquito repellent - I cannot stress this enough. There are a lot of mosquitoes. Warm clothes - the evenings get cold. Water bottle (particularly for hikers). A printed copy of the "Bandai and Me" guide. It has everything you need to know in it and will let you plan your weekend independently. Please download from the link above. A guitar, footballs, cricket bats, tennis rackets or whatever fireside fun you want to have. Chargers for your numerous devices. This year, as last year, we will be running a carpool to Bandai. Carpooling is great fun. It is a fantastic way to meet people, get your party mood started, and listen to someone else's iPod. Drivers: Just like last year, we will reimburse you 1000 yen per each carpooler you take. Take three passengers and you could be looking at 20% of your trip paid for! We will also have directions for you. Obviously MAJET cannot guarantee everyone a space in the carpool. We will do our absolute best. Last year ran without problems, and we aim to do the same again. Carpooling details will be finalized after the sign-up deadline has passed. There is a train station (Bandaimachi), but hopefully we have enough helpful drivers to get us there! Click the pins of the map for handy info about each place. Cancellations after September 9th will incur any cancellation fees that we are charged as an organization. Sorry! We will only charge you what we are charged for your cancellation. Organizing for a big group is very difficult, so we would appreciate it if you could give us as much notice as possible. Again, you must use the sign-up form below. An RSVP on Facebook means nothing except that you maybe, kind of, sort of want to go. This season is a very busy time in your schools. Please check with your school that you are not needed on the weekend of the trip. Often the ALT is the last person to hear about things, so please make absolutely sure you do not have a PTA meeting/culture day/enkai/etc. before you RSVP. This is particularly relevant if you are new, as it is probably assumed you know the school calendar. Click here to sign up for bandai!